A Retractable Waterproof Roof is the ultimate in outdoor weather protection. Using a flexible PVC fabric, a Retractable Roof will provide up to 100% UV protection, it will reduce glare from the sun, and it is a fantastic source of shade. These benefits have a dramatic effect in summer by reducing temperatures, making outdoor areas nice and cool. For those who don’t like cold weather, you will be glad to hear that Retractable Roof’s provide 100% water protection as well. 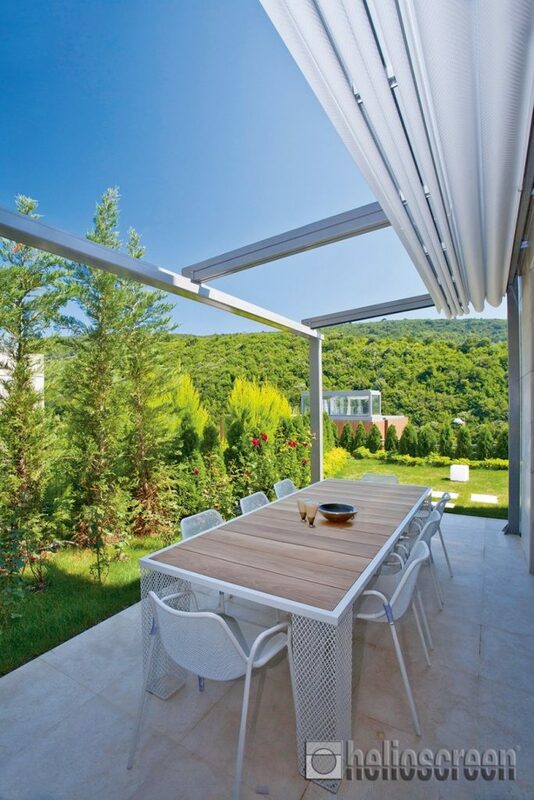 They can even be used to create new outdoor rooms, by enclosing an area with drop down blinds. The gold standard in outdoor canopies, Retractable Roofs offer fantastic all-weather protection. Simple but effective, Retractable Fabric Roofs are a great option to consider for your home or business. Being such a versatile product, they are perfect for backyards, courtyards, home patios, and even commercial settings. Why install a Retractable Roof? A slimline structure, quality Somfy electronics, high wind ratings, plus a contemporary design that is functional; these are just some of the reasons why Retractable Roofs are a favourite choice for designers and architects alike. Not only do you get high levels of weather protection, Retractable Roofs also look fantastic as well! They are often quite visually stunning, so much so that they create an artistic feature in their own right. 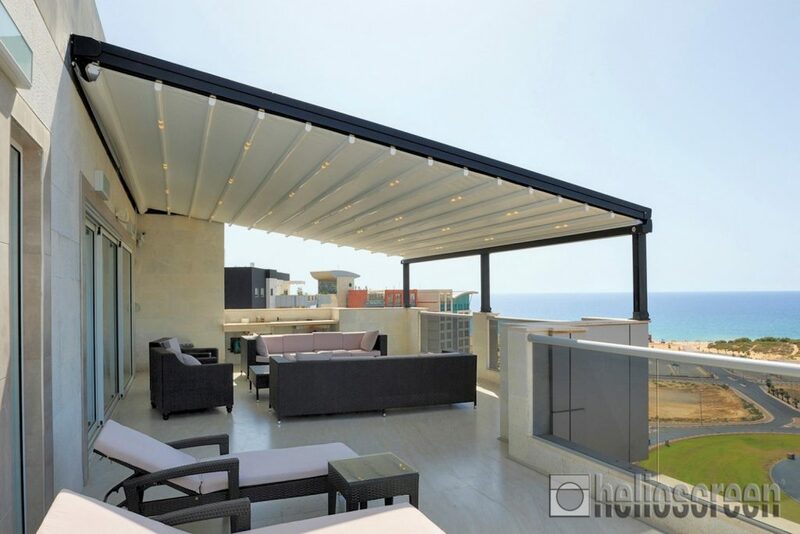 Helioscreen offer a range of modern Retractable Roofs, which are aesthetically pleasing, with a certain style that suits fine dining and outdoor entertainment. How does a Retractable Roof work? 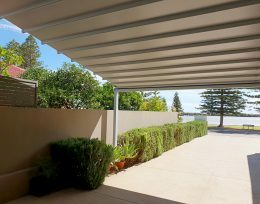 The fabric canopy is supported by a series of aluminium cross battens, and those battens are in turn connected to a set of rafters. Using a simple belt drive (that sits within the rafters) and a remote-controlled motor, the cross battens are pulled back and forth to either end. With the PVC fabric attached – the canopy is then neatly folded away in a matter of seconds. When extended, the fabric forms a strong and robust canopy, able to withstand winds of up to 117km/h. Each Retractable Roof system comes with its own support frame and it can be retrofitted to suit most existing structures. What is truly unique about a Retractable Roof is the translucent fabric canopy – which provides high levels of protection, while still letting natural light through. This allows for well protected areas, while still making the space feel open and unrestricted. There is a range of colours to choose from and the fabric comes with a warranty of 5 years. During summer months the sun can create extreme temperatures, making outside areas too hot to enjoy. By installing a Retractable Roof System you can provide much needed sun and rain protection, and create a wonderful outdoor area to be enjoyed all-year round. 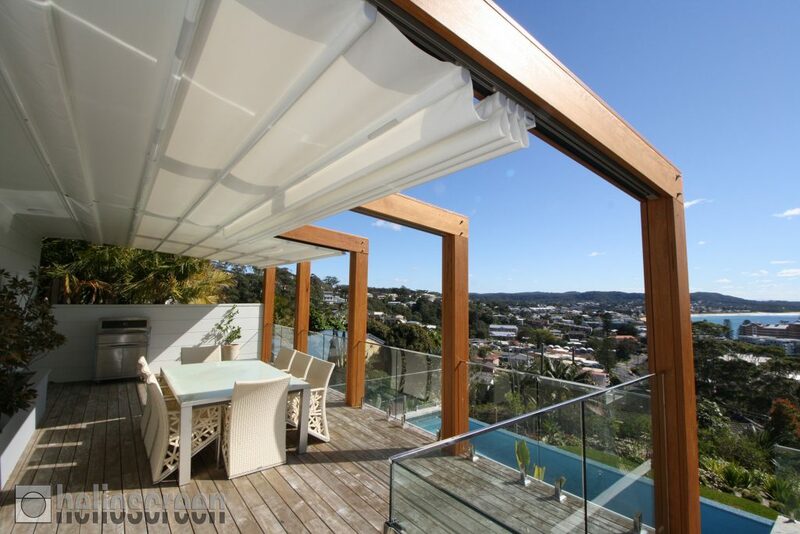 Increase the value of your home and create whole new outdoor rooms, install a Retractable Roof System today! 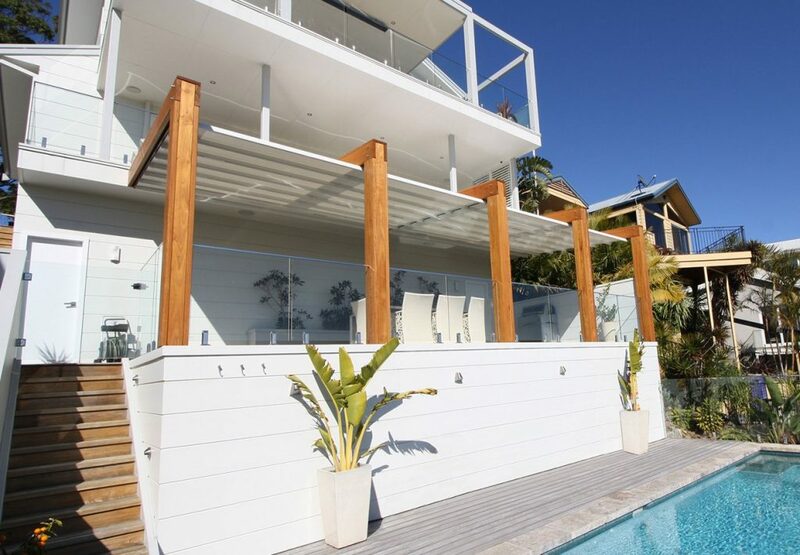 Retractable shading is very effective in temperate climates when heating requirements vary. This is especially true for east-west elevations where the sun has a long-lasting influence throughout the day. Having the option of retracting your shade is very useful when the weather is cold and you want to let some sunlight and warmth in. This ‘passive’ solar heating increases overall comfort and it reduces the amount of artificial heating required in your home. A wide variety of wall fixings and mount options are available to suit individual projects. Chemical hold-down bolts are used in conjunction with strong concrete footings, to tie the structure down. By retracting the canopy in strong winds, the structural wind loads are reduced considerably. This allows the structure to be able to withstand very strong winds. What’s the difference between a Vergola and a Retractable (Fabric) Roof? There are some retractable canopies that use slats or louvers as covering. One of the more popular louver Roof Systems is called the ‘Vergola’. These slatted systems serve a similar function to Retractable Fabric Roofs – they are a fantastic source of sun and rain protection. However these louver systems fall short in one critical aspect – the canopy doesn’t fully retract! Instead, these louver systems us a set of slats that pivot on the spot. While some sunlight is let through, quite a lot of sky is still obstructed. This problem is made even worse, as these louver systems often require large support structures. This is why Vergolas and other slatted canopies can make outside areas feel cramped or boxed-in. A much better alternative is to install a Retractable Fabric Roof! Using the flexibility of a PVC fabric, a Retractable Roof allows you to fully retract the canopy, leaving only a few support structures in place. As a result the outside area feels open and unrestricted, creating the perfect conditions for those clear summer nights! There are many add-ons that you can include with your Retractable Roof, depending on your unique requirements. 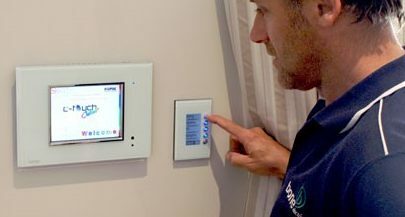 1) Automated controllers such as home C-Bus systems and sun sensors, are used to program the Roof, making it even easier to control the amount of protection you need. 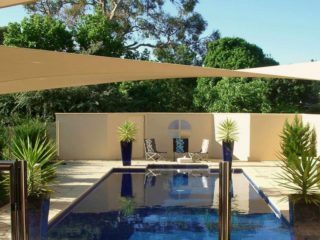 These systems are designed to think for you, simply enter in your desired times for extending and retracting the shade, and the system will follow your unique requirements. Sun Sensors control your awnings automatically, bringing them in and out depending on the amount of sunlight. 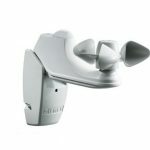 2) Movement, and Wind Sensors are used to ensure your system is well protected. At the first sign of bad weather these sensors automatically retract the canopy, protecting it from any wind damage that may result. 3) Integrated guttering and down-pipes ensure the rain water is collected, and then dispersed. Keep your outdoor areas dry and remove all rain quickly and efficiently, using these rain water systems. 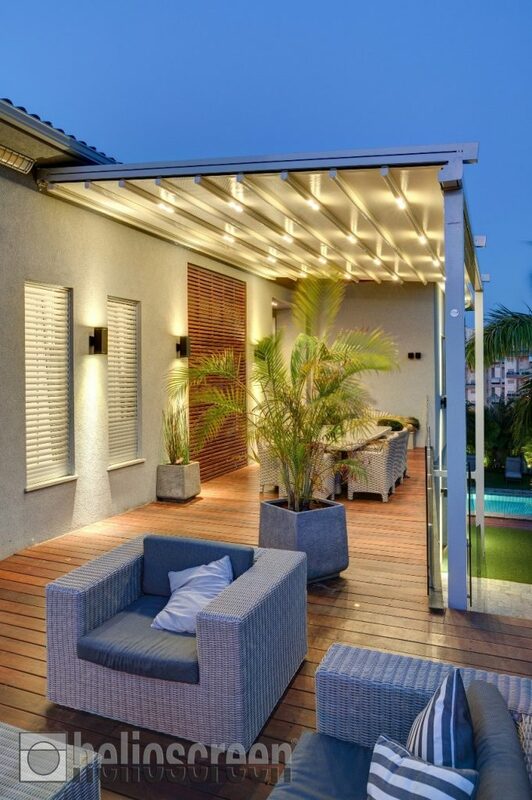 4) LED lighting provides that extra bit of ambience, transforming your outdoor area into a whole new room. Completely re-vamp the whole look of your outdoor area, and enjoy it at night, using these efficient lighting options. 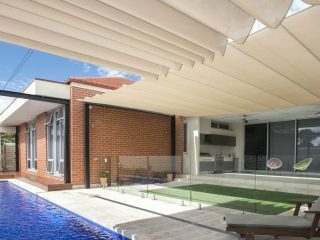 Conventional structures like pergolas and fixed skillion roofs, while still great choices, they are quite often not the best solution. This is because once you have a fixed canopy in place, you cannot move it! And in the temperate climates of Australia’s coastlines, there are quite a few cooler days when you don’t want a canopy. In other words, a fixed canopy can create ‘too much’ protection! This is why Retractable Roofs are such a fantastic solution. By swapping out the colour-bond for a flexible PVC fabric, you can control the amount of protection you need at any given time! You still get the same level of sun and rain protection, but now you can retract the roof when you want. Let warmth and sunlight through on cooler days. Also help aid in natural heating of your home during winter. Best of all, create fully contained weather-proof rooms and enjoy the outdoors all year round! A Retractable Roof should be installed by a team of shade experts. It is also important to have a thorough design process, including preliminary sketches, drafting, and any site inspections that need to be performed. Armed with a local team of manufacturing and installation experts, Shadeform can deliver on all requirements you need to install a fantastic retractable canopy. If you are in South Australia, Shadeform can provide a range of products and services, including design, manufacture, and installation. We at Shadeform are proud to specialise in the largest and highest quality canopies on the market today. Our in-house design and management personnel will ensure your project goes smoothly and is delivered on time. Contact Shadeform today for any queries you may have about Retractable Roof Systems, or other shading needs. We have agents in all main-land states of Australia, so feel free to drop us a line at any time. 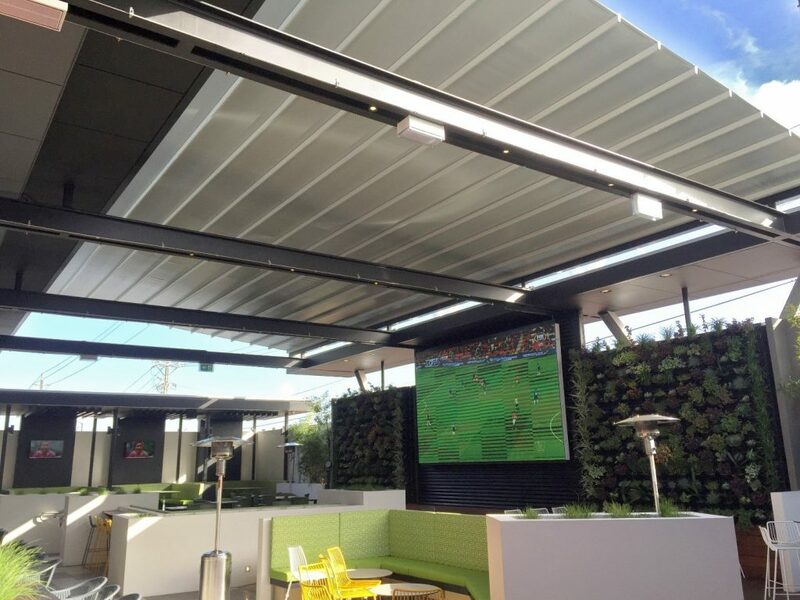 Shadeform’s massive 125 square meter Retractable Roof at the Coopers Ale House, Gepps Cross, SA. If you would like to learn more about outdoor shade structures and Retractable Roof Systems, contact Shadeform today. For over 30 years, we at Shadeform have strived to create the very best shade structures available. Now we are proud to pass this knowledge on, through our very own online blog. Learn everything there is to know about shade design and construction. Gain special access to a range of articles, including insider tips and expert advice!